Two-term N.C. Rep. Cecil Brockman (D-Guilford) begins this legislative session as the only openly LGBT member of the North Carolina General Assembly. Last year, amid the controversy over HB2, Brockman came out as bisexual – something he says even his family didn’t know. 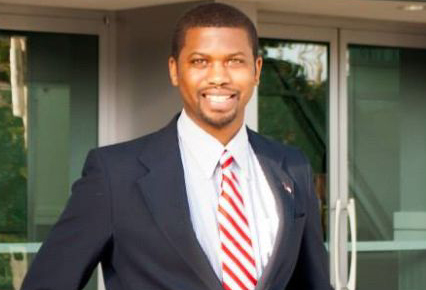 His experience as an aide to former Rep. Marcus Brandon, an openly gay black state representative, gave him the opportunity to see the challenges of being an out politician up-close – and didn’t make the decision to come easier, once elected. We caught up with Brockman this week, as the General Assembly reconvenes in Raleigh and the specter of HB2 – and the possibility of its repeal – continue to dominate political conversations in the capitol. 1) With the exit of Chris Sgro, your former fellow representative from Guilford County, you are now the only out LGBT lawmaker in all of the North Carolina General Assembly. Was it a difficult decision for you to come out as bisexual last year and what led to your doing so? Chris was leaving and I knew there would be reports that Chris was the GBT member of the General Assembly and that he’d be leaving the LGBT community without a voice. And I knew that wasn’t true. I knew what my sexual orientation was, I knew what I identified as. And I really began thinking about coming out to people. Chris and I and [Sgro’s husband Ryan] actually went out to a restaurant – Ham’s in High Point – right after a Guilford County banquet. Chris was wearing an HB2 button, so was Ryan – and someone came over to our table. They asked the table if we were gay. Chris said yes and that enraged the guy and he started staying all sorts of really crazy stuff…I can’t even say everything he said. It was one of those moments that you have, where you don’t even believe it’s actually happening. You don’t think it will ever happen to you. That really enraged me – I had a few things to say to the guy before the management took him away. But that really enraged me to the point where I was so offended. I think that Donald Trump in this election kind of encouraged people to come out and express some feelings to the LGBT community. And Pat McCrory and HB2, I think some people were encouraged to say some things they wouldn’t have said if it hadn’t been for HB2. Especially in the African American community there are kids who are exactly the same as I am. I wanted to give them courage and let them know you can be an elected official, you can be a doctor, a lawyer. I also didn’t want to be a hypocrite. I wanted to be honest about myself and who I am. It’s been a mixed bag. I’ve had some family members who have said some things that are a little bit offensive. I don’t think they knew it was offensive, but I found it offensive. People have also expressed support for me. There are still people who think homosexuality is wrong and they genuinely have an issue with this. Some people for religious reasons – I’ve got family members who have an issue with this for religious reasons. I knew some family members I would have an issue with it more than others. I would say, you know, around the whole…it’s been very positive for me. It’s allowed me to just be who I am and not have to worry about whether somebody disagrees with that or not. I think people respect the fact that I’m willing to lay all my cards out on the table and just be who I am. I don’t necessarily know if my coming out has given me more access to any of the conversations that are going on [around HB2]. Maybe more so in the Democratic caucus, where they at least I would say realize the importance of having the LGBT voice. 2) The failed repeal of HB2 late last year, during an extra session of the NC General Assembly, was a deep disappointment to many people. What do you think are the chances for a full repeal in the current session and what will it take to accomplish? I would say the Republican caucus…they do realize the effects that HB2 has on people, but they have more conservative folks who feel the way they feel about LGBT people and they’ve been fear mongering…they’ve scared their people into thinking that LGBT people and transgender folks are going to go into bathrooms and commit assault on our kids. It’s made the repeal of HB2 even harder. I don’t think they know how to turn off the fear-mongering switch they’ve started. The people in the LGBT community don’t commit sexual assault in higher numbers…if you were to make a law based on statistics, it would be a straight white guy at the top of that list. But because they are not an LGBT person, because they don’t understand what it is to be a member of that community…it’s easier for them to be prejudiced against that community. I’ll be working on a bill myself, an HB2 repeal bill. It fully repeals HB2 and what it would also do is it would increase all sexual assault penalties if anyone were to be sentenced – they would get higher penalties. We would increase all penalties on sexual assault. It also gives general protections to LGBT people all across the state. As a Democrat, I would say across the state that’s a good compromise. HB2 doesn’t increase any penalties for people doing what they say they’re afraid of and there is no enforcement mechanism. All it is, is a way to make people afraid of transgender people. 3) If a repeal of HB2 is possible, as some Democratic and Republican leaders are suggesting, what is the next step? Can individual municipalities expand LGBT rights without more backlash at the state level and another HB2-style standoff? I think one of the things the bill we’re working on would do is create protections at a statewide level. African Americans we have statute in there to protect us but the LGBT community, we don’t have anything in there to protect us. Once you have those statewide protections, what you can say is — on a statewide level, the state has already done this. You have at least one base, set standard. If you’re really serious and genuine about your fears of having people commit these crimes in a public restroom, you should be for this bill. This is more enforceable than a bill like HB2 that has no enforcement mechanism and increase anybody’s penalty. I think again it’s more of drawing a line in the sand. I don’t necessarily think that all of this bill will pass. Hopefully we can pass a full repeal of HB2 and pass tougher penalties and start to have a real conversation about making sure the LGBT community to pass. We don’t want people in the LGBT community to have *more* rights – we just want to be equal. Businesses have shown time and time again whether it’s the ACC, the NCAA or Paypal, that’s what they want too. 4) Last year you faced some criticism for co-sponsoring the Achievement School District Act, which allowed private charters to take over five of the state’s lowest performing schools. Would you explain your support for this move and what you hope to see in this area in the coming year? Most of the people who are against he achievement school bill are against it because it changes a traditional school to a charter school. At the time of the bill the statistics showed that every single demographic group was doing a better job in a charter school than a traditional public school. African Americans – it said 2/3 or 66 percent of African Americans were not proficient in our traditional public schools. And 54 were not proficient in charter schools. Those are both not great numbers. But what that says to me is that traditional public schools have been around forever and what they’re doing isn’t working. If there’s a failing charter school, there’s a mechanism where you can shut down a charter school – a charter school can’t fail for three years and continue to operate the way it’s operating. But a traditional school can continue failing for decades and there’s no mechanism. There are schools in my district that have been failing for decades and a lot of them are in poor black communities. I don’t support the status quo where 66 percent of people who look like me are failing. I am a progressive. I think we need to significantly increase the support for our public schools. But we can’t hold our heads in the sand and pretend there’s not a problem where there’s one race that is just not learning. If you wouldn’t send your kid to a school that has been failing for decades, why do you think I should send my children to that school? I think we’ve got to have a real conversation about the achievement gap and proficiency levels our kids have. But what happens too often is traditional public schools get off too easily, we’re not allowed to be critical of our public schools. But it’s critical, especially for our black leaders, to be critical. It’s imperative, I think, for black leaders to stand up and not continue to support a status quo system that is continuing to fail people who look like them. If we had a bill tomorrow where we could double the support to our public schools, I would support it. But that’s not the reality of the situation. I decided to take a seat at the table and discuss this. f I was not on that bill, if I did not negotiate, then certain progressive things that are in that bill wouldn’t be in it. The fact that we have innovative zones in the bill, for instance – it gives public schools charter school flexibility. Traditional schools have been arguing for years they would like the flexibility that charter schools have. The one piece people don’t seem to like is just the charter school aspect. It says it has to be a successfully run charter school. Not a charter school that doesn’t have a history of success. That’s not the people who would get the contract to run these schools. I think, for me, I don’t think that’s a bad idea – to have somebody who has experience and success come into a situation where there is not success and try to turn that around, turning a traditional public school into a charter school. To me that doesn’t sound like a bad idea or a crazy idea. To me, that sounds like a good idea. I think people are just upset at the model – that their school is not a traditional public school. Us trying to protect a system that is not doing good by us — to me, that seems silly. It’s a crisis right now for African American kids. It should be a crime and a travesty for African American parents who are looking at these numbers. 5) The country is deeply divided. The state is deeply divided. The North Carolina General Assembly is deeply divided. At this time, what can and should North Carolinians frustrated with our politics be doing to help? I would say stay engaged in the political process, the legislative process. Don’t stick your head in the sand the next four years and not be aware of what’s going on. It should encourage you to become a participant in the political process and not just during the presidential years. Every single time there’s an election you’ve got to get out there and vote and you’ve got to encourage your friends and family to vote. That’s the only thing you can do to change things, if you don’t like the way things are going right now. So as much as you can, feel encouraged to be part of the electoral, the governmental, the legislative process – whether that’s writing your legislators, running for office yourself or organizing. As much as you can — fake news is a really big thing right now. Buying the paper, going to those trusted sources where you can get information – that’s the only thing that can save us, making sure we get the facts out there and not these “alternative facts.” We have to have real reporters out there – so we have to support our local papers and national sources.